On today’s meeting of the EU-Catalonia Dialogue Platform, MEPs have counted with the presence and testimony of three out of the seven exiled Catalan politicians; Meritxell Serret, Toni Comín and Lluís Puig. All of them are exiled in Belgium since the Spanish State is persecuting them due to the organisation of a referendum in Catalonia. Just after providing an update on Catalonia and on the state of Spanish-Catalan relations with the new socialist government, the floor has been given to Lluis Puig, former Minister of Culture of Catalonia. He has pointed out that on October 1, 2017, there were two referendums going on simultaneously: one in Catalonia and another in the Iraqi Kurdistan. In this sense, he has asked to the audience how is it possible than the only referendum that had been repressed through the use of force and state violence had been precisely the one being carried out in a EU member state. 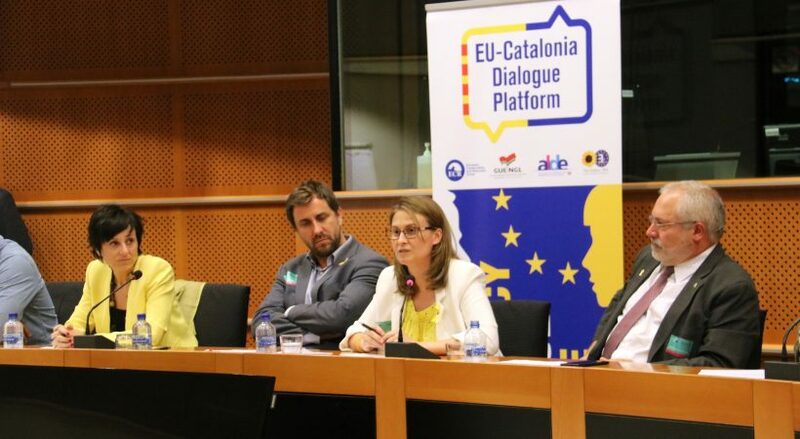 Following Mr. Puig’s argument, Ms. Meritxell Serret, former Minister of Agriculture and, since two weeks ago, the new Delegate of the Government of Catalonia to the EU, has emphasized that regardless of how big the democratic problem between Catalonia and Spain is, this has to be solved through “democratic means” and, especially, from a position of “bilateral respect” between the Catalan and the Spanish governments. Finally, Catalonia’s former Minister of Health, Mr. Toni Comín, has thanked the work done by the EU-Catalonia Dialogue Platform with the aim of promoting dialogue and a democratic solution to the political conflict instead than a judicial one aimed at criminalizing political actions through Spain’s Supreme Court and its penal code. According to him, at this point in time it is of key importance to explain to the rest of European citizens that the Catalan movement for independence is far from being one based in identity and in the homogenize Catalan society. Instead, he defended that the pro-independence movement represents an integrative project focused at creating a republic where peoples and cultures would be able to coexist. Following, you can read the letter sent to our Platform by Jordi Cuixart, President of Omnium Cultural (civil society association) who still remains unfairly jailed since last October.